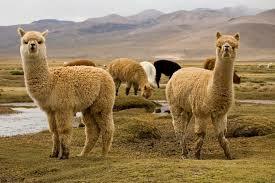 Alpacas originated in the Andes mountain range of Peru, Chile and Bolivia. This is an area of high altitude (12,000-14,000 feet). The temperature has less seasonal variation and ranges between 20-60° F. A member of the camelid family, alpacas are considerably smaller in size than both the camel and the llama. 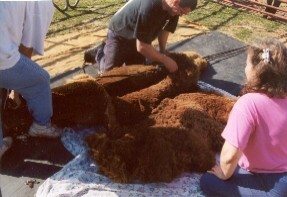 The first large-scale importation of alpacas to North America was from 1983-1984. 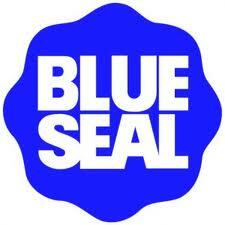 Importation was ceased in 1998. 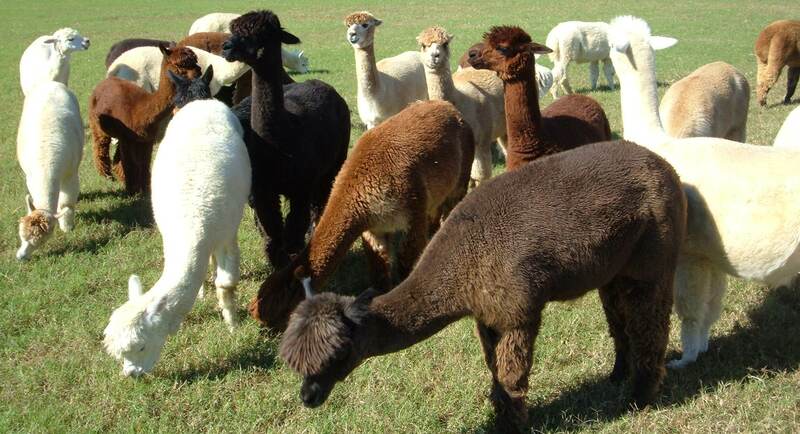 According to Alpaca Registry Inc. statistics, as of December 2013 there are 244178 registered alpacas in the United States. The alpaca is the world's most color-diverse fiber-producing animal.1 From blazing bright white, delicate fawns and browns, to bays and natural jet blacks, the beautiful soft fiber of the alpaca displays itself in an array of twenty-two (22) distinct shades of color. These color variations make their fiber highly sought after by handspinners and the fiber industry. The beauty of alpaca fiber is that it has versatility and the ability to cross the spectrum of possibilities in textile production. It allows for ALL alpacas of ALL ages to have valuable fleeces. 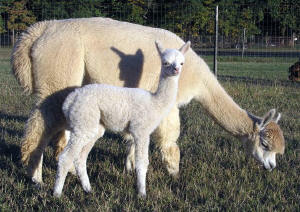 The variability in micron, crimp, and color makes alpaca the most versatile over any elite fiber-producing breeds. The alpacas are gentle on the land and are managed very well on small acreage. They require good shelter from the heat and inclement weather, routine nail trimming and vaccinations. They will produce one cria (baby) per year and are sheared once a year. Alpacas eat plain grass, such as orchard grass, and are usually fed a supplement feed of pellets or grain mix especially formulated for the alpacas. They are also given access to free-choice salts and trace minerals. Alpacas are not used as a pack animal due to their smaller body size and bone structure. Alpacas are approximately 36 inches tall at the withers and are about 4.5 to 5 feet to the tips of their ears. There are two breeds of alpacas: the suri (pronounced surrey) and the huacaya (pronounced wah-KI-ah). The suri has a fleece that has very little crimp and so the fiber strands cling together and hang straight down on the body looking like long pencil locks. The huacayas fleece has a lot of crimp which make them look really fluffy like teddy bears. The female alpacas weight approximately 100 to 150 Ibs. and the males approximately 140 to 180 lbs. They are easily transported in a minivan for the occasional short trip or a horse trailer for the longer journeys. Alpacas are not an aggressive animal and the only sound that is usually heard from them is a soft humming sound as they communicate with each other. The males will sing their own songs during breeding which is referred to in the alpaca world as ♫ orgling ♫. 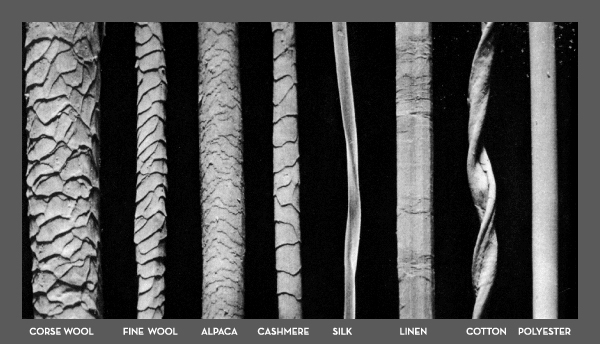 Alpaca fiber is measured in microns (the thousandth part of a millimeter). The finest class of alpaca fiber is "baby alpaca" which is rated between 20-22 micron. Superfine fiber is rated between 25-26 microns. Alpaca fiber occupies a very small niche in the world textile fiber market. There are "co-ops" or "fiber pools" available allowing alpaca farms of all sizes to gain access to commercially manufactured finished products. Their service utilizies economies of scale and saves a tremendous amount in manufacturing costs at each step of the process. The New England Alpaca Fiber Pool is a great supporter of Clearview Farm and Ranch. An average growth rate of approximately five (5) inches annually should be expected. 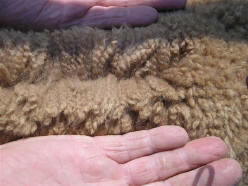 Alpacas given ample and good quality year-round diets produce fleece weighing one (1) to thirteen (13) pounds annually. Fleece uniformity refers to the even distribution off all the characteristics: diameter, color, staple, crimp (or crinkle), density, handle, softness, and tensile strength. The length of the alpaca fiber makes it stand out against the cashmere. The length allows for the creation of garments that are stronger and more durable than cashmere. Alpaca fiber has a natural luster making it outshine the dull fuzz of cashmere. Alpaca is easier to clean and stays cleaner longer. Cashmere garments require cleaning more frequently than those made with alpaca because cashmere can absorb body moisture. Alpaca sweaters far outlast even the finest cashmere. Cashmere claims to be warm, yet it can't hold a candle to the insulating characteristics of alpaca. Cashmere can hold up to 15% moisture, whereas alpaca doesn't absorb at all. It wicks the moisture from between the fibers, moving that moisture away from the body creating a more comfortable environment for the wearer. (1) Water is the most important nutrient. The average adult alpaca drinks 1 -1½ quarts of water each day. Intake will increase with exercise, lactation, and high temperatures. (2) Energy-providing feeds are the next most important nutritive value. Energy is available from carbohydrates, fats, and proteins. It is found in feeds such as pasture forage, hay, grains, and pelleted foods. A 150-pound alpaca can consume about two (2) pounds of dry matter per day.